There are many different species of ambrosia beetles in theUnited Statesbut only a few are considered to be a concern with in the metro Atlanta area. The droughty conditions have put many trees in a declining state. The increased number of declining trees has increased the populations of the Ambrosia beetle which results in an increase tree death in the Atlanta area. Adult Beetles start to emerge late February early March so early detection is key. Ambrosia beetles will breed in living trees but most prefer dying or recently cut trees, logs, and pulpwood. They breed in hardwoods, particularly Oaks, Poplar, Beech,Hickory, Pecan, Elm, Sweetgum, Baldcypress, Magnolia, Maple and Pine. It bores into the sapwood and heartwood of logs and makes hundreds of pin–size holes; each stained with fungal growth. The fungus is generally referred to as ambrosia and serves as food for the larvae and adults. The fungus clogs the trees vascular tissues resulting in no water or nutrient uptake to the leaves. If there are enough beetle larvae at work, the tree usually will die quickly during the hot summers ofAtlanta. 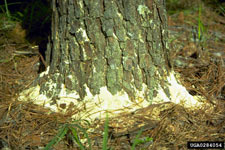 Piles of whitish boring dust (frass) around a tree’s base indicate an ambrosia beetle infestation. Canopy of the tree starting to change color typically fall color or brown dead leaves. The Asian ambrosia beetle has become established throughout much of the South. This beetle attacks a wide range of hosts including Magnolia, Crepe Myrtle, Sweetgum, Cherry, Persimmon, Pecan, Maple, and Oak. Long strands of (frass) are often seen sticking out from infested trees. The mode of action is the same with this beetle but will typically attack smaller diameter trees. It is important to remember that stressed trees can be attacked repeatedly by the multi generations this beetle has and will need repeated applications of insecticide. 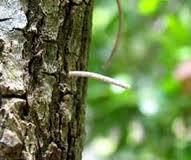 When chemical treatments are used, efforts always should be made to improve overall tree health. We recommend calling one of our consultants to evaluate your property and provide you with a preventive borer spray prescription and/or evaluate the current populations infested in your tree(s).